We've all seen it before: the ambitious leader who enjoys great success and then, inexplicably, crashes and burns. Perhaps this leader has been you. Why does this happen, in spite of the leader's vision, talent, and emotional intelligence? Richard Boyatzis and Annie McKee, co-authors, with Daniel Goleman, of the international best-seller Primal Leadership, argue that today's leaders face unprecedented challenges that result in a vicious cycle of stress and sacrifice, with little or no recovery time built in. Consequently, even the most resonant leaders, whose ability to deftly manage their own and others' emotions once drove their companies to greatness, end up spiraling into dissonance. 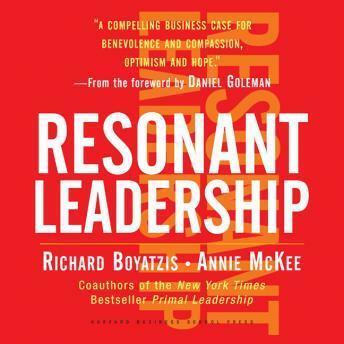 In this new audiobook, Boyatzis and McKee marshal decades of multidisciplinary research and hands-on consulting work to provide a practical framework for how leaders can create and sustain resonance in their relationships, their teams, and their organizations. To counter the inevitable 'power stress' of the leadership role, leaders must consciously manage the 'Cycle of Sacrifice and Renewal' by stepping out of destructive patterns and renewing themselves physically, mentally, and emotionally. Through vivid examples, the authors show how three key elements - mindfulness, hope, and compassion - are essential to enabling renewal and sustaining resonance. Leaders can't sustain effectiveness if they can't sustain themselves. Resonant Leadership offers inspiration, dozens of exercises, and other tools to help listeners become and remain successful leaders in their work and in their lives.